There are no manufacturing identifying marks on this pottery jug. The bottom is glazed, but the base rim is not. It is 7 1/2 inches in height and 4 3/4 inches across the bottom. 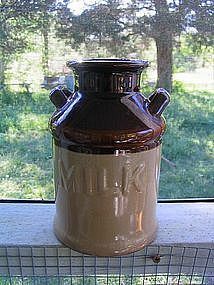 No chips, cracks, breaks or rough rim, but does have crazing, some of which has darkened slightly on the back of the jug. I need your zip code to calculate the postage.